Designed to minimize environmental impact on the surrounding wooded parkland, this wood and stone home takes in stunning views of the Potomac River. It is perched on a ridge high above the C+O Canal, on the foundation of an old cabin, and oriented to take maximum advantage of available sunlight. Mature oaks and poplars shade the approach and entrance. Living spaces open to a large great room that faces the river and a stone veranda. Bedrooms open onto small courtyards that provide outdoor rooms to enjoy the beauty of the seasons. This zero energy home and its systems are designed to harmonize with the surroundings and be resource efficient. 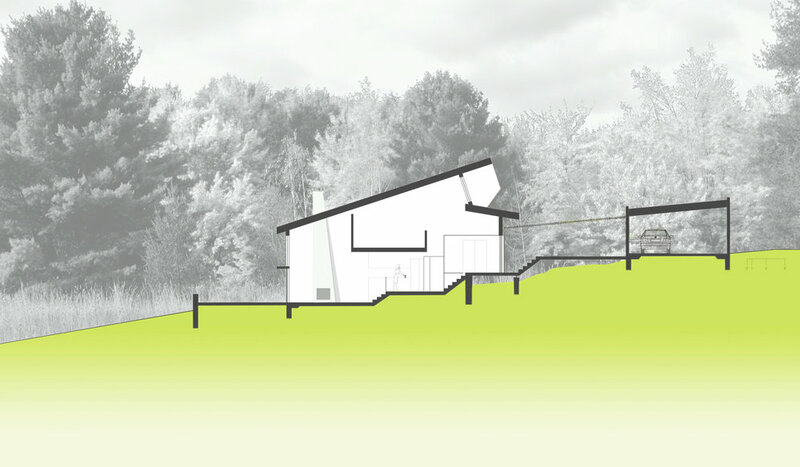 The walls of the house are sculpted in locally-sourced wood and stone, while a large portion of the roof is a planted green roof system and the area with greatest sun exposure is covered with a solar array. The roof is sized so that the solar panels provide all of the home’s electricity, and the rainwater collected provides irrigation and domestic grey-water needs. Nestled into the ground, the home’s siting preserves views and provides insulation. Radiant floors augment the passive solar design which takes advantage of shading and thermal mass to make sure the home is comfortable year-round.